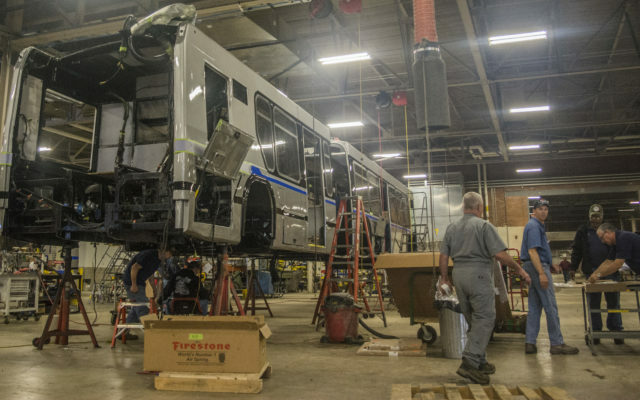 Workers at Maine Military Authority and Loring Industries recently completed a lengthy bus renovation project for the Massachusetts Bay Transportation Authority, according to a news release from the Maine Department of Education. LIMESTONE, Maine — Workers at Maine Military Authority and Loring Industries recently completed a lengthy bus renovation project for the Massachusetts Bay Transportation Authority, according to a news release from the Maine Department of Education. As a result, over 50 MMA employees have been released and the state-operated MMA is shutting down operations. “As part of the process of winding down operations, MMA will no longer be able to contract for school bus refurbishment and has reached out to school districts to inform them of the changes in their operations,” states a press release the Maine Department of Education issued Aug. 21. The MBTA project involved overhauling 32 buses that will be used for public transportation in the Boston area, and began with a $19 million contract in 2014. Unanticipated budget shortfalls lead to Gov. Paul LePage and state lawmakers approving an additional $7 million to save the contract and jobs for MMA. Loring Industries, a newly formed LLC that is part of the New England Kenworth Group, is also located on the former Loring Air Force Base and stepped up to supply specialized parts for the project, along with some of their own employees for labor. MMA also tried to employ its workforce to refurbish school and municipal transit buses, but apparently did not obtain sufficient contracts to keep operating. The DOE suggested in its release that school districts which were considering refurbishment services may now be eligible for the Maine school bus purchase program. MMA Executive Director Tim Corbett said he could not currently comment. The Loring Development Authority Board of Trustees discussed the future of MMA during a meeting in late June, specifically citing that the organization planned to turn the two buildings it was leasing back to the LDA. Carl Flora, LDA President, said during this meeting that negotiations were underway between both Loring Industries and MMA regarding the transition of assets, tools, equipments, parts, and facilities. Loring Industries head of Business Development Tim McCabe said earlier this year that he hopes to line up a number of projects on the former base and, ideally, to hire as many former MMA employees as he can for these endeavors. McCabe was not available on Tuesday morning, but Loring Industries Service Manager Scott Groene indicated that the business has hired one MMA employee and that both organizations are still “in limbo” at this point pending results of negotiations over equipment and facilities.